This is a review of Tineacide Athlete’s Foot Cream by Blaine Labs. It is a product which promises to eliminate and relieve the fungal infection that leads to Athlete’s Foot as well as its symptoms. The manufacturer claims it is a fast and effective treatment. This is not a complete list of all ingredients, there are a number of inactive ingredients as well. The key active ingredient of Tineacide Cream, undecylenic acid, is used in treatments for fungal infections of the skin like jock itch and Athlete’s Foot. Aloe Vera has been used in remedies for a variety of conditions, and has shown some evidence that it can be detrimental to some fungi and bacteria. Another natural ingredient in this product is oregano oil which is thought to have anti-bacterial, anti-fungal and anti-viral properties. Peppermint oil, like menthol, has cooling effects that can soothe irritated skin. Peppermint also contains antimicrobials as well. The affected area should be cleaned with water and soap then dried prior to application. Twice a day the cream is to be smoothed into the skin around and between the toes or as otherwise instructed by a doctor. 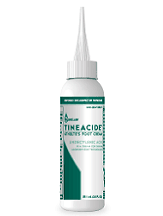 Tineacide Athlete’s Foot Cream can be purchased either online or in-store through various retailers. A 1.25 ounce tube of the cream, depending on the place of sale, costs $13-$17. When ordering online shipping may add extra charges to these prices. A friend recommended that I try Tineacide to treat the severe fungal infection on my feet. They had experienced great results with this treatment. Although it did seem to take some time (almost 2 months) before my infection completely cleared up, I started having relief from the symptoms within a couple weeks. I am satisfied with how this product has taken care of my athlete’s foot, but overall, I was not too thrilled about how long it took to start seeing any significant results. Possible side effects that can be caused by the active ingredient, undecylenic acid, include burning and irritation of the skin which the cream has been applied to. There is also the possibility of an allergic reaction as with most medications. You should seek prompt medical attention if any adverse reactions or symptoms occur. Tineacide is backed by a 100% money back guarantee. If after using the product as directed and there has not been a satisfactory amount of relief, a customer can contact the manufacturer directly to receive a full refund. We could not find information clarifying details of return requirements. Tineacide Cream is an effective treatment for Athlete’s Foot. It comes with a satisfaction guarantee, and has a nice blend of natural anti-fungal agents. However, the guarantee was unclear on specifics such as time or condition requirements. It is also slightly expensive compared to other similar treatments.